The design of this banner was conceived in response to a call at Uluru in July 1999 to "Raise up a new standard of righteousness over Australia." It is based on the concept of Christ's blood-dipped robe of Revelation 19:11-16. The white represents the linen robe worn by the rider on the great horse. The red represents the blood into which the robe was dipped. It is through that blood that we can be made righteous (Romans 5:9). It is through His holiness, His atonement and the truth of His faithfulness that the standard of His righteousness is raised in our lives. 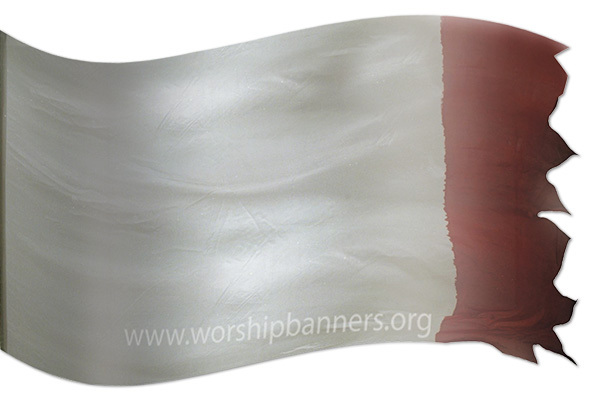 Use the banner to celebrate and declare righteousness, the character or quality of being right or just. Declare The Lord Our Righteousness (Jeremiah 23:6), His faithfulness, holiness, truthfulness and consistency with His own nature and promises. ( Psalm 48:10, 65:5, 97:2; 119:37; 145:17; Romans 3:5; 1 John 1:9). Declare the righteousness of Christ spoken of in Psalm 45:7, Isaiah 11:5; 42:6; 59:16: Jeremiah 23:5; Revelation 19:11. Heed and proclaim the calls to righteousness - right action. (Daniel 4:27; Hosea 10:12; Matthew 5:20; 1 Corinthians 15:34; Ephesians 6:14; Philippians 1:11; 1 Timothy 6:11). Jesus used the word righteous to describe things that were right or just in themselves; conforming to the will of God (Matthew 5:6, 10, 20; John 16:8, 10); persons appointed by God to be acknowledged and obeyed by man (Matthew 3:15; 21:32) and the sum total of the requirements of God (Matthew 6:33). Righteousness is a gracious gift of God to all who believe on Jesus, bringing them into right relationship with God. It is unattainable by obedience to law, by man�s merit or any condition other than faith in Christ (2 Corinthians 5:21, Romans 4:3). Wallow in it! Atonement, Blood-dipped Robe, Faithfulness, Holiness, New Standard, Righteousness, The Lord Our Righteousness, Truthfulness. Red: Atonement (Isaiah 1:18, Joshua 2:18,21, Leviticus14:52; Hebrews 9:14; 1John 1:7), Bloodshed, Blood of Jesus, Cleansing, Death, (2 Kings 3:22, Revelation 6:4,12:3) Life Sacrifice, War.